Every year students pay $600+ to test prep companies to prepare for the SAT. Now, you can get the same preparation in a test prep software program for a fraction of the cost! 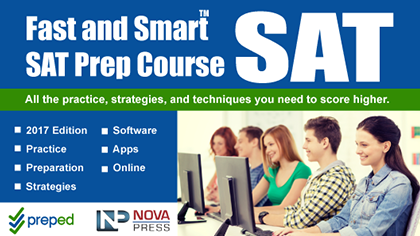 There is no quick fix that will allow you to “beat” the SAT, but our test prep software will prepare you to master it. First, work your way through our guided lessons reviewing and analyzing SAT content. Next, take your time to do as many SAT-style practice problems as you need! Our software contains hundreds of practice problems, all with detailed explanations to help you to the right answer. A significantly improved SAT score for only $47? You can’t afford not to try it! Math: Seventeen Lessons, with exercises, (provide comprehensive review of SAT math properties, including the new concepts from Algebra II. Reading Comprehension: Develop the ability to spot places from which questions are likely to be drawn as you read a passage. Writing: Comprehensive analysis of the SAT Essay, including writing techniques, punctuation, grammar, rhetoric, and style. 506 in-depth video explanations of questions. * SAT is a registered trademark of the College Entrance Examination Board, which was not involved in the production of, and does not endorse, this product.